If there is a community event in Las Vegas geared toward lending a helping hand to the less fortunate, it is not an uncommon sight to see Chef Jeff Henderson in the house. That passion for helping and inspiring others is rooted in his own life story: a former drug kingpin who spent a decade in prison, he is now at the head of a business empire that includes a new book (“If You Can See It, You Can Be It: 12 Street Smart Recipes for Success”) and a soon-to-debut television show (“FlipMyFood”). 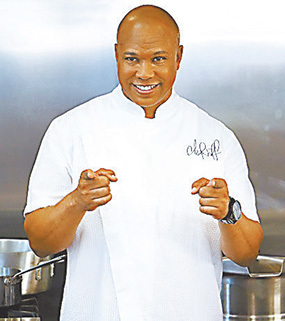 With speaking engagements in front of Fortune 500 executives and tapings of his hit series “Family Style with Chef Jeff” filling up his calendar, we caught up with the New York Times bestselling author to get the lowdown on all his successful endeavors. Why are you in New Orleans? I have a place down here in New Orleans and the production company for my show is based here. I film my show, “Flip My Food,” from New Orleans. There is a whole film industry moving to New Orleans because of tax credits and financial breaks for film and television production. Do you still have a residence in Las Vegas? Oh yes! You know I will always keep my residences in Las Vegas, because it’s tax-free for corporations. I am back and forth between both cities. Tell me about your new television show. My new television show, “Flip My Food,” is a nationally syndicated daytime show. It will air in between 50% and 70% of the markets during the first season, starting in September. The whole concept of the show is centered on me traveling around middle and southern America as a traveling chef. I have a custom food truck that has been changed into a mobile kitchen studio. I flip food and make it healthier. No, the production company asked me to come up with a concept because my other show, “Family Style with Chef Jeff,” proved to be a television success. The show premieres Sept. 8 and we will have taped 150 shows. We are halfway through. What would you say to others who might have a not-so-positive past on how to build a successful future? During my former life, I learned a lot of business traits. I have always been a hustler and also an entrepreneur and now I brought the two together. I call myself a “hustlepreneur.” I changed products. Whether you are selling drugs, cars or houses, there are certain traits that successful people possess. These traits include: good communication skills, knowing who you are, knowing what your gift is, the ability to play to your strengths, while managing around your weaknesses, cultural intelligence and the ability to communicate with folks who maybe don’t look like you or didn’t come from your environment. I made a conscious decision many years ago that I wanted to change my life, and a guy I met from Wall Street told me that the only thing I had to do was change my product—and the product was me. So, I took the good out of my bad and played to my three strengths: cooking, writing, and speaking. These are my revenue streams today, that is contributing to my living. I have integrity, and have made a lot of changes in my life. I am married with five children. I will soon release my own branded pots and pans and “urban kitchenware.” I know my gifts and I play to them. I am blessed to have met some amazing people. Any new updates on the film Will Smith is doing on your life story?